NASA finds something else climate models are missing…. forcing from 'Secondary Organic Aerosols' | Watts Up With That? A new paper published by NASA by Tsigaridis and Kanakidou suggests that climate models have missed the forcing effects of organic aerosols, such as VOC’s from trees, oceans, and other sources that combine chemically in the atmosphere to create new compounds. Known as Secondary organic aerosols (SOA), they say “SOA forcing could exceed that of sulfate and black carbon”. Aerosols are produced from the atmospheric oxidation of volatile organic compounds (VOCs), which are emitted by plants, household products, and combustion of hydrocarbons. Tsigaridis, K., and M. Kanakidou, 2018: The present and future of secondary organic aerosol direct forcing on climate. Curr. Clim. Change Rep. , early on-line, doi:10.1007/s40641-018-0092-3. Secondary organic aerosols (SOA), a subset of organic aerosols that are chemically produced in the atmosphere, are included in climate modeling calculations using very simple parameterizations. Estimates on their shortwave forcing on climate span almost two orders of magnitude, being potentially comparable to sulfate direct forcing. In the longwave, a neglected part of the spectrum when it comes to SOA, the direct SOA forcing could exceed that of sulfate and black carbon, although in absolute values it is much weaker than the shortwave forcing. Critical for these estimates is the vertical distribution of the climate active agents, pointing to SOA temperature-dependent volatility. Over the last few years, research also revealed the highly oxidizing character of organic aerosol and its chemical aging in the atmosphere that partially leads to the formation of brown carbon, an absorbing form of organic aerosol. This review summarizes critical advances in the understanding of SOA behavior and properties relevant to direct climate forcing and puts them in perspective with regard to primary organic aerosol and brown carbon. These findings also demonstrate an emerging dynamic picture of organic aerosol that has not yet been integrated in climate modeling. The challenges for the coming years in order to reduce uncertainties in the direct organic aerosol climate impact are discussed. High priority for future model development should be given to the dynamic link between “white” and “brown” organic aerosol and between primary and secondary organic aerosol. The SOA temperature-dependent volatility parameterizations and wavelength-dependent refractive index should be also included. March 27, 2018 in Aerosols, Climate Models. ← "Carbon trading" in the EU fails, emissions on the rise again. Wasn’t it Spiro Agnew who talked (and was ridiculed) for talking about “smog caused by trees”? The more things change…..
Not quite, it was Reagan. VOCs were CARB’s boogey pollutant, and it set levels at such that the trees and such exceeded the permissible limits, leaving nothing for industry. Reagan was ahead of time. People remembered smog from industry and engines, so telling them that trees emit volatile organics was too much. It is the dims who are afraid of DHMO, but take a spoolful of digitalis spp. because it’s organic. This is one reason why I doubt the Svensmark hypothesis. There is such a surfeit of condensation nuclei in the atmosphere that I don’t see cosmic rays making a significant difference. I read some research that postulated the effect of cosmic rays is not direct but indirec, acting via effects on such aerosol molecules which then act as condensation nuclei. Beats the hell out of EVIL CARBON doing it all. But if there is already an abundance of condensation nuclei then who cares whether extra condensation nuclei are created from direct or indirect effects? In my opinion the atmosphere is so complex that it cannot be predicted what any input change will cause in the long term. That means, I accept that the climate is chaotic. This is what the data show. Ships and planes will only produce such clouds when the subsisting conditions are already on the cusp of producing clouds in any event. Thus they affect the distribution of cloud formation and not the total of cloud formation. More aerosols do not create more clouds in our open atmosphere. You can see that by watching a plane’s vapour trail when it is travelling through a high pressure cell. The vapour trail is snuffed out very quickly and sometimes does not form at all. A cloud chamber is very different because the setup is designed to create vapour when a particle passes through. The real outside world is not a cloud chamber. Which is why we shouldn’t cut down the rain forests to produce ‘carbon neutral’ bio fuels. By around 1900 we did cut down the white pine forests in the upper Midwest, I often wonder what effect the loss of VOCs and white pine pollen had on the region’s climate. It seems like it was more rainy in my area back then. Just recently I learned some people collect white pine pollen for food, if it is food for us was it also food for other things like insects and fish? What happened when all that food was taken away? That pine forest smell? Good. That nasty chemical odor from PineSol? Human sourced VOCs. The models do account for these SOAs. They are just an amplification of the cooling effect from VOCs. Remember, the models are parameterised to match the past. Therefore, there is no relevance to how the VOCs actually affect the climate. They only model how they effect the climate. “The models do account for these SOAs. They are just an amplification of the cooling effect from VOCs. Could you re explain the above so us morons can grasp what you are trying to say? 1) The models include VOCs (Volatile Organic Compounds) as a variable. 2) The models say VOCs are a cooling input. That happens to be correct, in my opinion. 3) How much the models say that VOCs cool is dependent on curve fitting to the past. Well, in fairness, curve fitting biased by expert intuition. 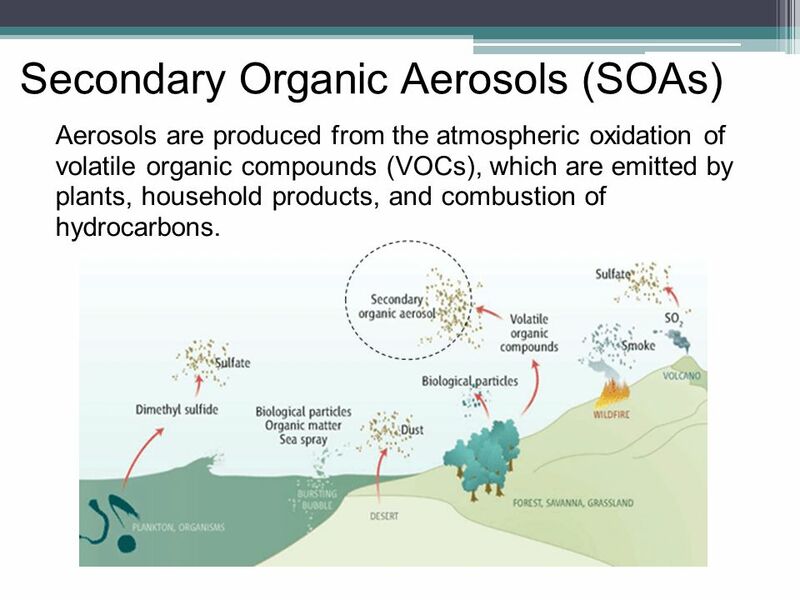 4) That VOCs become SOAs (Secondary Organic Aerosols) is irrelevant because the models only look at the cooling effect. They do not care about the cooling mechanism. 5) How VOCs affect the climate is a single mechanism. How SOAs affect the climate is another mechanism. But the models don’t care about any mechanisms. They just output a scenario – that is an “effect”. So, in the terms of what models do, VOCs are not distinguished from SOAs. Somehow why do I get the feeling that the climate modellers are going to use that study and come up with a conclusion that the SOA’s are a heating effect and produce more forcing? Then us skeptics will be forced to chase 2 tails ( hoax tales) not just one. My apology for putting poetry over clarity on a science blog. M Courtney, I think you have much oversimplified climate modeling, Mechanisms are extremely important. Unless you have read and understood the paper (and apparently you haven’t), i think it’s pretty cheeky to interpret it to others in the way you did. “Remember, the models are parameterised to match the past. This is not a logical deduction, nor is it true. Models are based in reality, so of course it’s relevant how VOCs actually affect the climate. However if VOC production is itself temperature dependent, which it is (take a sniff in a pine or eucalypt forest on a hot day), then things get more complicated. Models are based in reality, so of course it’s relevant how VOCs actually affect the climate. Are you really saying that the models interpret the chemistry of atmospheric organic carbon so perfectly that they can hind-cast the temperature outcome? To do that they would need to understand everything else perfectly too. Obviously the models are tuned to match the known output: past temperature. Therefore the models are not based on reality. They are based on a guess as to how reality might work. A) The mechanisms are irrelevant as the models are tuned to imitate the outcome with no real understanding of the climate. B) The mechanisms are relevant but eh models have all got them wrong before, yet somehow still have matched the past temperature. B cannot be true. But A cannot be admitted. “Are you really saying that the models interpret the chemistry of atmospheric organic carbon so perfectly that they can hind-cast the temperature outcome? >>>No, I’m not saying they are perfect, but that are based in reality. They model processes, the movement of energy and matter. Some of the model is data-based, some is mathematical representations of climate interactions. >>>That’s not always the case. Google “the art and science of climate tuning” for a good explanation of the diverse ways of climate tuning. Often they don’t tune to the same time frame against which they are validated through hindcasting, and some tuning happens during model development before they are even coupled. >>>>You really believe it’s guesswork? Is that all meteorologist do, too, is make guesses? Do you disbelieve weather forecasts, too? >>>>All wrong, yet still can model the past and “somehow” get it pretty much right? What mechanisms are “all wrong?” There are some unknowns (cloud/aerosols), yes, but science has a way of finding answers. What about the predicted changes that have happened? Maybe they weren’t all quantitatively spot on, but qualitatively they did pretty good, and that was the old models. “science has a way of finding answers”. But if that way isn’t affected by a change in the inputs then that way is not finding answers that are justifed. The models do not go wrong when signifncat inputs (like aerosols) are incorectly added. Therefore the models do not react correctly to the inputs. If they still get the “right” results then they will always get the “right” results regardless of all the other mechanisms too. That is why the models do not reflect reality. They just mimic the historical outputs in a way that seems reasonable to the programmer. “The models do not go wrong when signifncat inputs (like aerosols) are incorectly added. Therefore the models do not react correctly to the inputs. I don’t think this is a correct assumption. It’s true that there are problematic areas of the models, but that doesn’t mean that the models as a whole are filled with them. The parameters, their importance and representation of reality are not all equally difficult to get right, and the accuracy and predictive capability of the different parameters varies across models, which is one reason careful comparison of methods and outcomes is so important – an area that is being explored more now than in the past. There is a huge disconnect between the perception of models’ ability to project the future between those who support AGW and those who deny it. It would be nice to get at the real cause of this. It’s a pretty safe bet that it’s not based on comparable levels of understanding the current science of climate and modeling, since it would be tough for those outside the field to learn the background then keep up with recent research. Nor is it a result of bias on the side of AGW supporters alone, since anyone can be affected by bias and political ideology, something I haven’t ever seen admitted here. Why is that, when so much emphasis is put on “alarmists” and their ideology? To me this is very significant. Ok, well, digging through UCAR’s CESM, I do see that they have a SOA module. Haven’t found how they plug it in, or if it differs materially from the VOC method…but if I understand your point correctly, you’re suggesting that they do treat them the say way they treat VOCs? SOCs are made from VOCs. So as the concentration of SOCs increase, the concentration of VOCs must necessarily decrease. Now, what is the relative value of “forcings” from SOCs, vs. VOCs? If the forcing from the two are not a whole lot different, then nothing much is really happening. Also, we have to note that people have been studying the atmospheric chemistry of VOCs since forever. I am not sure if any of this is really new. I think it’s not new, but that climate modellers have just swept it all under a rug for years with crude parameterizations because it’s a bit too hard for them to actually include some realistic bioorganic chemistry in their models. Unfounded assumptions, silly insults. ignorance of modeling. What!!!!! Climate models are missing some more forcings?????? Can’t be! I’m in shock! Any relation to reality springs to mind. We’re starting to get the big picture at NASA! Do we know enough about the ocean contribution? It is not just sulfur compounds. Organic matter was enriched in foams from 885 to 5541 times, but trace elements such as copper, manganese and nickel were from 100 to 100,000 times more abundant than normal ocean waters. Data from Hillier, E. L. 1975. Composition of sea foam. Ph.D. dissertation, Texas A & M University, College Station. I just drove over 30 miles along a strong onshore wind blowing off the Gulf of Mexico which looked like a lot of smog. We’ve got some idea about the dust off of N. Africa, but it does make me pause to consider the oceanic aerosol contribution to the ACE index. And the surface of your vehicle is a bit greasy and salty from all the incoming GOM organics too I bet? Were you on FM-2004 from Freeport to T.C.? Corpus Christi to Rockport in sight of windmills. Salt was a problem from Harvey, even before. In the 50s there was someone in Port Aransas who covered his new car will oil because of the salt. Very dirty, but he thought it slowed rust down before the days of galvanized bodies, etc. Some days you can taste it. Even plankton has been found in it. Uncertainty caused by “something else climate models are missing” make the denizens more certain. Fascinating logic. well, more certain of what? “More certain that models have it wrong” seems pretty logical conclusion, doesn’t it? No, just certain. Certainty in general and since certainty is a delusion, quite illogical too. Meh, as long as it brings happiness and joy. I don’t understand the concept of “certainty in general”, but I am certain that 2+2=4 (among other things), and certain this is not delusion. paqyfelyc: The things you are certain about are incomplete; See the Godel Theorem. I don’t know what you’re talking about, but generally comments not directed to anyone specifically accusing commenters of something unclear, like being ‘just certain’, are not very useful. Am I certain? Does it bring happiness to you to think I’m ‘just certain’? I must tell you I don’t think the headpost brings any certainty in the play. More like one little parameterization more. People who sell politics based on the ‘fat tail’, tend to exaggerate uncertainty while at the same time telling the science is settled. You forgot to indicate the degree of certainty to your conclusion. of certainty is a scientific methodology. I think it just describes crude guesses with only a marginal connection to reality. Another meaningless knob to twiddle? Well it would help if they at least mention what the effect is. I suspect it is to further reduce the impact of CO2 (thereby preserving their ‘science’ – it would be hotter if it wern’t for the specks). Their reluctance to say so supports this notion. We have expanding forest cover over the past 35 years (+14% in 2012, so~17-18% by now) and general growth in existing plants – this makes for a lot more SOA. Two things. First, this stuff “shadows” the ground, reducing incident solar. They leave us guessing but mention of white and brown aerosol “interaction” suggests white reflects, brown heats up and then white blocks pathway to space. Hey I thought the likes of Tsigaridis and Kanakidou were to be girding up for space shots not doing more global warming warning. Can some honest specialist swallow his fear and tell folks that PM2.5 is handled just fine by the lungs if the material is relatively inert and of benign chemistry (cigarette smoke is 2 microns and not benign). particle shape is important – acicular (needle like) mineral particles can stick into the lung tissue and these tend to be larger than 2.5 microns. The lungs are turfed with fine small clumps of motile hairs called cilia and lubricated with mucous. The hairs sweep particles of this size captured by the mucous upwards out of the lungs where we can clear our throat and spit them out. Silica is unfortunately somewhat soluble and a lifetime of gold quartz mining over loading the cilia system results in stagnation and the depositing of fast silica crusting in the lungs leading to death. Smokers when they are young can also expell the smoke muck in this way but eventually overwhelmed the cilia stop working. Smoke is a chemical soup that can lead to cancer or the failure of the cilia and resultant emphysema. The beautiful smell in a pine forest is SOA. It won’t hurt you. It is good for you as is the dried sea spray of sallts along coastal areas. Even a bit of wood smoke is fine. Reember, a lethal dose of milk will kill you but don’t lose any sleep over it. Interesting comment. I’d guess that the VOCs from a pine forest, isoprene, isoprenoids and various volatile adducts are more odoriferous than SOAs, however. SOCs and VOCs and all the other three-letter acronymous things are apparently very imperfectly understood, if at all. I do not oppose researching them, experimenting with them (in very limited ways), and trying to understand them better–but I DO oppose leaping from the limited knowledge we now have, into actually trying to solve problem(s) we do not know exist, by spending countless billions on measures that would likely only make matters worse. Too many people use these researches to try to manage our lives and our money. I favor pure research, at this point; leave the “solutions” till such time as we know what we’re doing. I yearn for a dictionary of acronyms. Available upon a click. When would that be? What will it take for you to believe “we know what we’re doing”? Have you followed the improvements in the models? Is there some particular reason you think they aren’t good enough? And most important, are you sure you know enough to judge? Will there ever be a point at which you are convinced that it’s worth investing in prevention, or is that simply not an option? Really, i’m interested what you have to say. “What will it take for you to believe “we know what we’re doing”? In my case this would require that the GCM are able to model the most important temperature regulation process in the atmosphere, i. e. convection, on the basis of actual physical laws rather than crude parameterization. This will require going to kilometer-scale cells and minute-scale time-steps. I might add that I have considerable experience of computer-modelling complex processes (in a non-climate field) and it is my considered opinion that models with more than two, or at the very most three, parameterized variables are utterly useless. kristi, if you are part of a climate science modeling team i think i can see where the issues arise. stating certainty like that is directly opposed to the science.this is about as polite as i can convey my thoughts on this post of yours. Kristi: Do you think the issues raised by Bony and Stevens in 2013 have been addressed? If so, please can you post references? Thank you. NOTE TO TTY, BITCHILLY, SLOW TO FOLLOW: Thank you for your comments. It was a mistake to say, “we know what we’re doing.” I’m not involved in the field, and I know there are many here who know more about climate and modeling than I. My post was an attempt to understand; I’m not defending anything, nor denigrating others’ knowledge or perspective. In this post I make a few observations and ***speculations,*** but that, too, is part of a desire to understand the immense gulf in ideas about climate change, and why it is getting wider – comments welcome. Hmm. Unless you accept regional models, there’s not really much that can be done about this right now. So do I understand correctly that you want the whole global climate derived mathematically from basic physical laws? It seems then you would also have to have near-perfect data for the laws to act on. This sets the bar rather impossibly high. I’ve long suspected that past modeling experience was a factor in many skeptics’ rejection of climate models. I’m guessing some may be used to working with models that may be similar in some respects, but with very different scale and complexity, and different expectations of precision and certainty. Weather forecast models are perhaps the most similar, but because those become unstable after a couple weeks, it’s understandable that meteorologists may think that there has to be some kind of “cheating” going on. Below are just a few links from a quickie search. The literature is immense. Without being familiar with it, it is very easy to assume things about modeling and modelers that are not always true, such as the pervasive idea that models are tuned to mimic the same blocks of time against which they are evaluated (or, conversely, that all models have been developed with perfect objectivity). Because familiarity with the relevant published literature is necessary to the understanding of and practice in one’s area of expertise, a lack of it is a ***potential*** weakness in the evaluation of climate science by laymen. Publishing peer-reviewed research forces one to examine the literature. 2013; Andrews and Ringer 2014; Ogura et al. 2014). of cloud feedback (Watanabe et al. 2012a; Webb et al. “Too many people use these researches to try to manage our lives and our money.” It’s call control. Big government and dictators love control. The Smoky Mountains, which have been around for awhile, are “Smoky” because of the evaporation of Terpenes from trees, a class of photo-chemically reactive chemicals i.e.smog producers. A minor correction. The Appalachians are a mix of coniferous (pine softwoods) and deciduous (hardwoods) trees. I know, because we have a cabin in the Chattahoochie National Forest. So the Smokies are a mixed result of coniferous turpenes and deciduous isoprenes. It’s just more settled science. How many more changes to settled science do we expect? Interesting. So, tell me what happens to aerosols (both solid and gas) when it rains? Well there’s a puzzle – here’s another. Because they are reasonably complex chemicals that took a lot of resource to produce, no free lunch etc etc. Ozone protection maybe. Ozone is very unpleasant stuff, especially to plants. It’s made whenever UV meets oxygen. There is ozone in the stratosphere so why isn’t there any very much in the troposphere? As any health care person/doctor/medic or folks on vacation in hot and sunny places, there’s plenty UV and plenty oxygen – so where’s the ozone? Have the plants cleaned it up by releasing their VOCs – perfectly lovely chemicals just ripe for oxidation. Worth a moment’s thought eh not? Nowadays they are super clean what with hi-tech engines and exhaust catalysers. Previously they were not so clean and released some amount of unburnt petrol (a volatile organic compound if ever there was) into the city-scape. Would not that unburnt petrol have mopped up any ozone there was floating around said city-scape? And what have out elders and betters done here in the UK if not (20 years ago) idolised diesel and cleaned up petrol cars and pushed for higher efficiency. But high efficiency engines, a-la Carnot Cycle, require a high temperature burn and that produces much more NOx than it otherwise did. But diesels cannot run catalysers so the NOx escapes and powered by UV, reacts with oxygen to make ozone. And because there are few plants & trees in the cities (or petrol cars – all both emitting VOCs) to mop up the ozone, ozone levels skyrocket. Ozone is just as evil to us as it is toward the plants. It will smash up organic molecules in plants just as well as it does within bacteria or even our lungs. To clean up the air in our cities, might it even be worth releasing some VOCs of our own. Heavy ones that hug the surface, like propane or butane maybe? Should we be letting Bio-ethanol evaporate into the city’s atmosphere rather than burning it inside the car’s engines. Would cities be cleaner as a result? Utterly unthinkable innit though, especially for such closed and blinkered brains, trapped in their bubbles of magical thinking, convinced of their settled science, feeding off each other’s depression & guilt. Not to forget the tax-generating hypocrisy of it all. i wonder if the rise in asthma in recent years has anything to do with that ? how ironic would it be if all the attempts to clean up vehicle emissions resulted in greater risk to human health, particularly in large cities. interesting post peta. Based on this groundless speculation, you launch into a whole narrative about ozone and VOCs. It seems to me that this could be example of “magical thinking,” although I’m not sure what you mean by that. Plants produce chemicals for a few reasons. Some are simply byproducts of their physiology. Some are used in communication, for example to provide signals to pollinators. Some are the result of production of chemicals to prevent herbivory. Because of the expense of producing chemicals to counter something like ozone, which would constantly be replaced in the air around the plant, this is an exceedingly unlikely explanation. It would be far more likely that plants would adapt some internal mechanism of dealing with high ozone. Must be getting cooler again. Out trot the new excuses. Where were these aerosols 30 years ago? More than 2% of the words in this document consist of the single word “forcing”. As an engineer, I have always objected to the word “force” to describe what is clearly a “factor” and not a “force”. There is but one significant “force” in the earth’s climate, and that is the thermal energy from the sun. All the rest are “factors”. I was somewhat mollified when Willis, and probably others. described the use of the word “forcing” as a “term of art”. However, that still does not excuse inaccurate language in a field that purports to be science. I will cease to object to the use of the word “force” to describe what is clearly not a force, when those who use it will concede to me that “climate science” is not science, but rather, that it is “art”. You are welcome to object to the vocabulary used in climate science, but that doesn’t really get you anywhere. Many sciences have their own definition for common terms – “adaptation,” for example, has a specific meaning in the study of evolution. I think you’d find most climate scientists realize there is a difference between the forcing of the sun, which is an external driver of the Earth’s energy balance, and those forcings that are internal to it, such as albedo and atmospheric CO2. Although “forcing” may have been derived from “force,” it is not the same, is it? The sun provides energy that enable physical forces to act on climate, but solar radiation is not itself a force, but a forcing. Does that make sense? At the same time, you could be right that the term is used rather loosely among climate scientists. Sometimes it may be simply a matter of convenience, when others in the field know what is meant. I find the timing of this publication remarkable. Would it have been likely published before early 2017 had the data been ready? Likely not, as we were constantly reassured of the validity of the data by these organs of the executive branch of the federal government. They suffer from the whims of the head of the branch and the political appointees. Now it comes out that we have an unaccounted for VOC/PM soup that “may” be greater in concentration and emittance than all anthropogenic VOC/PM’s combined and it wasn’t in the climate models. This supports the whims of the era. I recall reading here some years ago about these very things. Settled science? Smells more like political science. we gotta ban (for god sakes don’t burn….BAN) them trees. From the “If we look hard enough in obscure places, we might find something” school of climate science. I’ve commented about this for at least a decade, so finally someone noticed. Altogether now — forests put VOC in the atmosphere, especially when heat stressed. Just seach for ‘Forest terpenes and other VOCs’ for all the info.